The cognitive computing software can inform users about how specific foods will influence their glucose levels, track diets over time and spot otherwise hidden patterns in that data. Sugar.IQ with Watson, billed as the first-of-its-kind cognitive app for people with diabetes, took center stage September 27 at the 10th Annual Health 2.0 Fall Conference in Santa Clara, Calif.
Sugar.IQ, revealed jointly by Medtronic and IBM, uses real-time continuous glucose monitoring and insulin information from Medtronic pumps and glucose sensors. It leverages IBM Watson’s cognitive computing power, combined with Medtronic's expertise in diabetes, to find hidden patterns in diabetes data. The app provides real-time personalized insights on a single platform that brings together relevant data, context and insights. 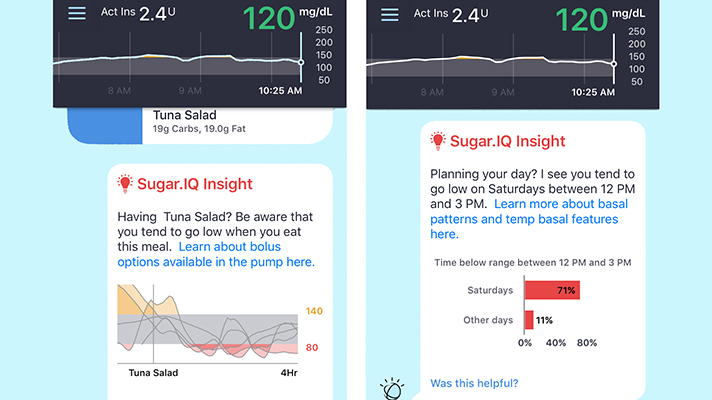 The Sugar.IQ app is designed to help answer key questions that people with diabetes have about their current health status, about where their health is trending and what actions they can take to better manage their diabetes in the future. More specifically, Sugar.IQ can be used to uncover behaviors that influence glucose levels and send appropriate alerts to users. The app’s Glycemic Assist feature enables users to inquire about how specific foods impact their personal glucose levels, and the software can track food to deliver meal-related insigths to help people better control their diabetes. When the companies unveiled Sugar.IQ, at the Health 2.0 Fall Conference in Santa Clara, Califonria, they also said they would offer a limited launch of the application to 100 users of Medtronic’s MiniMed Connect mobile accessory users to explore the design and usability of the Sugar.IQ app and provide feedback on their experience ahead of the app’s broader rollout later this year.